UFW Stories: "The Day I Will Never Forget"
"The Day I Will Never Forget"
A good friend of mine had just called me. Cesar was in town and asked if I would I be available to be his body guard, to accompany him around the nation’s capital where he was to make radio interviews and give a speech. I answered quickly that I would. When I heard him speak, the impact he made on his audience was electrifying. He was most humble and unassuming, yet deeply charismatic and built of steel. Since these were the days when power point presentations did not quite yet exist, I asked Cesar if his presentations could not be made more powerful through the use of charts and graphs that compared the meager wages earned by migrant farm workers versus the earnings made by growers. He did not hesitate one bit to ask me to go with him and help him do that. To this day I still wonder what would have happened if I had been able to accompany him. 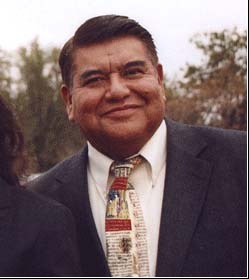 Later I was to invite Cesar to be the main speaker at a migrant farm worker conference in San Antonio, Texas, which I had organized for the National Council of La Raza (NCLR). At least one top NCLR official criticized me for attempting to invite Cesar with only three or four months notice. When I called Cesar, however, he immediately remembered me and said he would come to the conference. The conference in San Antonio was probably one of the last conferences Cesar attended, if not the very last conference. To me, he personified great leadership and more important the kind of caring that always leads all of us to feel: Si se Puede!